The Samuel Fox Country Inn has four deluxe en-suite guest bedrooms, each one individually designed, with tasteful decor and furnishings. 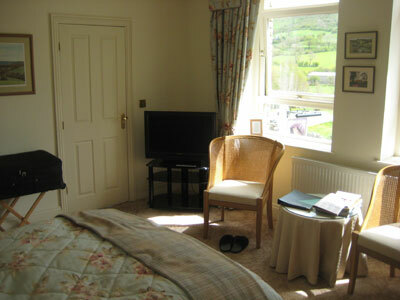 All have at least 26 inch flat screen televisions, Wi-Fi Internet access, and coffee and tea making facilities. Upon arrival, guests will find a welcome tray in their rooms with, in addition to freshly ground coffee and tea, sherry, grapes and chocolates. The large windows provide plenty of natural light, and give a sense of freshness that complements the superb countryside views. After a quiet night of slumber, room service continental breakfast is available, or weather permitting you can dine al-fresco on our private patio, or in the restaurant with a hearty cooked breakfast. The choice, as always, is yours. We're closed for maintenence and staff holidays in the New Year. We close on Monday 1st (open for diners for a lazy lunch only) and reopen on Friday 19th January.